I am fascinated, like many others, with failed expansion and relocation of big league sports teams. While I am aware of most from the MLB and NBA, there's still a lot I don't know about the NFL and NHL failed bids. I thought this thread would be a fun place to share some of those failed expansion and relocated teams. If there are any proposed logos, uniforms, etc. please share those! The Montreal Canadiens almost moved to Cleveland! also, didn’t the White Sox flirt with Tampa? Not sure if it was close enough to count, but Eagles owner Leonard Tose basically lost the team gambling, and was going to sell to a group from Phoenix before another buyer emerged. As did the Giants and to a lesser extent the Mariners. I even had a Tampa Bay Giants t-shirt at one time. The Baltimore Bombers Failed expansion from 1995. Before Tom Benson took over the ownership of the team, there was extensive flirtation with moving the team to Jacksonville. And I don't know if you were called it a "failed" relocation considering the circumstances, but there was the possibility of the Saints simply staying in San Antonio after Hurricane Katrina. For the Spurs, before moving into the Alamodome and in that awfully dark post-Gervin/pre-Robinson period, the Spurs were potentially moving to either Minnesota or New Orleans. Speaking of San Antonio, Red McCombs also did a prolonged song-and-dance with the Vikings potentially moving to the Alamo City, even doing preseason games to "gauge interest". And back to Minnesota, there was an effort to move the Minnesota Timberwolves to New Orleans in 1994, just four years into their debut, with the names New Orleans Rhythm and New Orleans Angels being thrown around. However, the bid was rejected due to questions about where Top Rank, the investment group that sought to move the team, was actually getting their money. Also for the Sacramento Kings, remember the Maloof Brothers were eyeballing Las Vegas and even Virginia Beach. There's of course the now legendary overnight move committed by the Colts moving from Baltimore to Indianapolis, but remember that if it wasn't for Jim Irsay Sr. being a belligerent drunk, the Colts had an initial deal with Phoenix but the city backed out due to the perceived backlash. There's the infamous move by the Seattle Seahawks in 1996 where they announced they were moving to Los Angeles (well, Anaheim specifically)...before actually informing the league about it. If I recall, they were even drawing up a new identity. And I think just about any MLB team in the seventies and eighties used Tampa Bay as a threat, with I believe the Giants going as far as actually making caps with "TB" on it. The Vancouver Grizzlies almost ended up in St. Louis. Don't forget how close the Sacramento Kings were to moving to Anaheim and Seattle. Bill Veeck tried to move the St. Louis Browns to Milwaukee before the Braves, which was blocked by other AL owners led by the Yankees. After the Braves left, the White Sox played a series of home matches in Milwaukee with an attempt to move, but that was blocked by the AL as well. There was at least one attempt to buy the Bucks in the mid 1980s and move them to Tampa. But that ended when Herb Kohl stepped in and bought the team. And to think what would've happened if St Louis got stuck with the Browns. There's of course the now legendary overnight move committed by the Colts moving from Baltimore to Indianapolis, but remember that if it wasn't for Robert Irsay being a belligerent drunk, the Colts had an initial deal with Phoenix but the city backed out due to the perceived backlash. I don't recall there being a failed dead with Phoenix. However, Irsay definitely flirted with Phoenix and Jacksonville as well as Indianapolis. 1. Football Cardinals to Baltimore in 1987 (I still have the t-shirt to prove it). 2. Bengals to Baltimore circa 1994-95. 3. 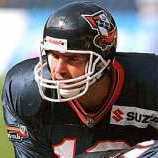 Buccaneers to Baltimore circa 199-95. Would the Seattle Pilots count as a failed expansion? They only lasted 1 year before moving to Milwaukee. Not really. “Failed expansion” means that the team never existed. The Pilots did exist, but Missouri Senator Stuart Symington :censored:ed them over by forcing the AL to expand in 1969 instead of the planned 1971, lest he threaten baseball’s anti-trust expemption. Source for this claim. So, if Symington was a little more patient, the Pilots might have stuck around. We've also forgotten about the Patriots near moves to St. Louis and Hartford. The White Sox/Tampa resolution, with the State of Illinois building the new park is the stuff of political legend. There was a midnight deadline for the legislative session. The governor and legislature were working out a deal, some arm twisting needed to happen, so the legislature stopped time. The clock in the chamber froze at 11:55 for a while. The governor got his votes, the ballpark plan was passed. Ted Stepien tried to move the Cleveland Cavaliers to Toronto, proposing they become the "Toronto Towers." I don't recall the year on that one, but it was late 70's/early 80's. The Grizzlies and Hornets both applied to relocate to Memphis on the same day, if memory serves me. Save Robert Kraft's intervention the Patriots would've wound up in St. Louis. Charlie Finley at one point or another had deals to move the A's from Kansas City to Louisville and Indianapolis, then from Oakland to Denver, and at one point he got as far as an AL owners' meeting with an idea that would've put the A's in Chicago, the White Sox in Seattle, and the Pilots in Milwaukee in 1970. The Pittsburgh Pirates flirted with Denver and New Orleans during their cocaine-fueled mid-1980's, with only a city-led public-private ownership consortium's acquisition of the team at nearly the last minute keeping one or the other from getting the team. Tampa flirted with more MLB teams than a four dollar ho' before getting the Devil Rays... Chicago, San Francisco, Cincinnati, Detroit and Baltimore are ones I remember distinctly, though Chicago and San Francisco are the only ones that really went anywhere. If not for the (first) move to Los Angeles, the then-Cleveland Rams would've either moved to Dallas, or folded. I was clearly too young for all the potential Tampa Bay teams. I didn't realize they were to baseball what Los Angeles was to the NFL until recently. -St. Louis Browns to Montreal in 1933, Browns to Los Angeles in 1942, Browns to Milwaukee in 1953 (Braves went there instead), tried again for Los Angeles in 1954 but no other team was willing to join them on the west coast so they went to Baltimore. - Red Sox were originally intended for Buffalo in 1901. -Yankees looked at East Rutherford on two occasions around 1971 and 1989. Yankees also looked at New Orleans in 1989. -White Sox looked at permanently moving to Milwaukee in 1970 after playing a handful of games there in 1968-69. The ill fated Seattle Pilots went there instead. The Sox then looked at Seattle in 1975 before the Mariners came to existence. Then around 1990 it was the midnight deal for Tampa/St. Pete. -Indians looked at Seattle and New Orleans in 1965-66. They then looked at Denver and East Rutherford around 1984. -The original Senators looked at Los Angeles and San Francisco in 1957 but the Dodgers and Giants were wooed to the west coast instead. The Senators then looked at Minneapolis in 1957 before ultimately moving to the Twin Cities in 1961. The Twins were one of several teams who looked at Tampa/St. Pete around 1984. Around 1997 the Twins looked at North Carolina in Charlotte, Greensboro, Winston Salem and Raleigh. Although not a relocation the Twins were a candidate to move to the AL in 1998 (Milwaukee went instead). In 1999 the Twins looked at Charlotte again as well as Portland and Las Vegas around 2000. The Twins were then a candidate for contraction around 2003 with the Expos. -The Athletics looked at Los Angeles in 1957. In the 1960s A's owner Charlie O. Finley was desperate to move the team but was constantly shut down by the league.. They looked at Dallas-Fort Worth in 1962, Louisville and Oakland in 1964, Atlanta, New Orleans and San Diego in 1965. In 1966 he tried Milwaukee and Seattle and even threaten to move them to a cow field in Peculiar, Missouri. He finally got his wish and moved the team to Oakland in 1968. In 1975 the A's almost went to Chicago to replace the White Sox who were looking at Seattle. In 1978-79 the looked at Denver and New Orleans. Phoenix came up in 1981 and San Jose around 2005. San Jose and Fremont also have come up a few years ago. -The Angels almost went to Long Beach in 1966 but ultimately went to Anaheim. -The Royals were a candidate to move to the NL in 1998 but Milwaukee went instead. - Before setting in Toronto the AL wanted to place the team in Washington. - The Rays supposedly looked at Montreal around 2016. - The Giants were looking at Minneapolis in 1957 but the Dodgers persuaded them to join them on the west coast. They then looked at Toronto in 1976, Tampa/St. Pete around 1993 and San Jose around 1996. - The Cardinals looked at Baltimore around 1916 and Houston around 1953. -The Pirates looked at New Orleans and Tampa/St. Pete around 1981 and then Denver in 1985. -The Reds threatened to go to San Diego in 1967, but got a new stadium in Cincinnati instead. San Diego joined as an expansion team in 1969. -The Astros looked at Washington in 1992 and Northern Virginia around 1996. -The Padres came close to moving to Washington in 1974. -The Expos almost went to Buffalo instead of Montreal in 1969. In 1989 they looked at both Buffalo and Miami. They looked at Washington around 1999 and were a candidate for contraction with the Twins around 2003. Around 2004 Portland, Charlotte, Monterrey Mexico, East Rutherford, Norfolk and Northern Virginia were looked at before moving to Washington for 2005. - The Rockies were supposedly intended to be in Tampa/St Pete in 1993 but the league only wanted one Florida team at the time. -The Diamondbacks were originally intended to be in the AL but were placed in the NL instead. The also looked at joining the AL around 2003 as well.